May 31, 2017, at 18:30 after a serious illness His Beatitude Lubomyr (Husar), Archbishop Emeritus of the Ukrainian Greek Catholic Church Church died at the age of 85. January 26, 2001 – February 10, 2011 he served as a Major Archbishop of the Ukrainian Greek Catholic Church. Born in Lviv, Ukraine, on February 26, 1933, Lubomyr Husar fled from Ukraine with his parents in 1944, ahead of the advancing Soviet army. He spent the early post-World War II years among Ukrainian refugees in a displaced persons camp near Salzburg, Austria. In 1949, he emigrated with his family to the United States of America. From 1950 to 1954, he studied at St. Basil’s College (Ukrainian) Seminary in Stamford, Connecticut. He continued his studies at Catholic University of America in Washington DC, and at Fordham University in New York. He was ordained a Ukrainian Greek Catholic priest of the Eparchy of Stamford on March 30, 1958. From 1958 to 1969 Fr. Husar taught at St. Basil’s College Seminary, and also between 1966 and 1969 was the pastor of Holy Trinity Ukrainian Greek Catholic parish in Kerhonkson, New York. In 1969, Fr. Lubomyr went to Rome, where he earned a doctorate in Dogmatic theology at the Pontifical Urbanian University in 1972. During his stay in Rome he joined the Ukrainian Studite monastic community at the Studion Monastery not far from Castelgandolfo, Italy, and was elected hegumen (superior) of the monastery in 1974. He was consecrated a bishop in 1977 in the Studion monastery chapel in Castelgandolfo by Patriarch Josyf Cardinal Slipyj. He was named Archimandrite (Abbot) of the Studite Monks in Europe and North America in 1978. When the Soviet Union collapsed in 1991, he returned to his native country and served as spiritual director of the newly re-established Holy Spirit Seminary in Lviv. In 1994, he established a new Studite monastery near Ternopil, Ukraine. The Synod of Ukrainian Greek Catholic Bishops elected him Exarch of the Archiepiscopal Exarchy of Kyiv-Vyshhorod in 1995. In 1996, the Synod elected him as auxiliary bishop with special administrative delegated authority to His Beatitude Myroslav Ivan Cardinal Lubachivsky, Major Archbishop of Lviv. Upon the death of Cardinal Lubachivsky on December 14, 2000, Pope John Paul II named Bishop Husar apostolic administrator of the Ukrainian Greek Catholic Archeparchy of Lviv. In January of 2001, the Synod elected him Major Archbishop of the Church and Father and Head of the Ukrainian Greek Catholic Church. The following month, he was named a cardinal by Pope John Paul II. In 2001, Cardinal Husar along with the Catholic bishops, clergy and faithful of Ukraine welcomed Pope John Paul II on his first visit to a former Soviet Republic. His Beatitude also became the first Chancellor of the newly established Ukrainian Greek Catholic University in Lviv, Ukraine. Under his leadership in August 21, 2005, the major archiepiscopal see of Kyiv-Halych was officially transferred to Kyiv, the capital city of Ukraine. 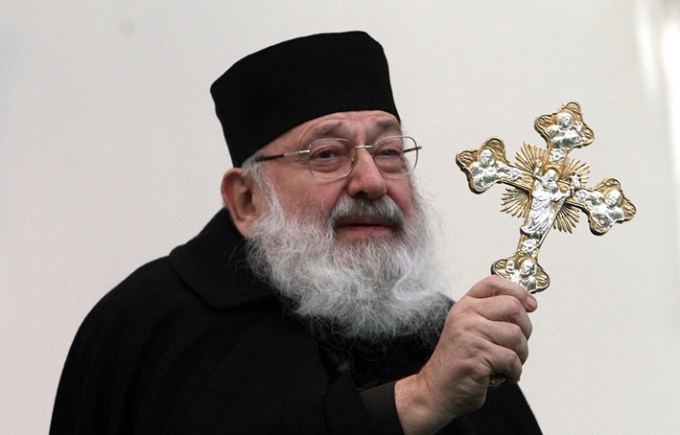 On 10 February 2011 Pope Benedict XVI announced that he has accepted the resignation of His Beatitude Lubomyr Cardinal Husar, father and head of the Ukrainian Greek Catholic Church and major archbishop of Kyiv-Halych in accordance with 126 § 2 of the Code of Canons of the Oriental Churches. Cardinal Husar remained active in ecclesial and social life of Ukraine.